While my opponents are joking, I'm wondering if I will call or raise. Ace-King. Let them laugh, I take the next pot. My son (the youngest participant among the 70 competitors) had bad luck. 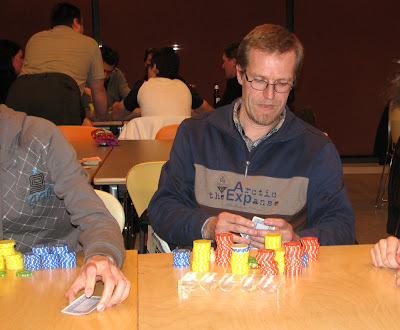 He is sitting next to a pro, who has already taken most of his chips. My son is out of the game due to his neighbour. Time for revenge. I've just managed to kick off the pro from the table, which costs him 50 € for losing a bet with another pro. With a big stack in front of me, I'm ready to join the final table. There, my luck ran out and I stranded at the 6th place. Nevertheless, I won 2 positions compared to last year (where I finished 8th with 50 competitors). It's 3 o' clock in the morning and time to drive home to my lovely wife who is chilling in bed, waiting upon me.